With Shoutcast rumored to be closing in December 2013 (AOL is getting rid of other web based services it acquired in the 90’s and early 2000’s, even WinAmp is on the chopping block, to concentrate on its core services), somewhere around 55,000 of their customers will be looking for an alternative option. Even if a buyout is made of Shoutcast, some of their customers may feel its time to leave. KryKey is the perfect option for them : they can use their own software as they do with Shoutcast, or use the in-house Studio. Bandwidth, listeners and even streaming hours are “unlimited”! KryKey also offers a full web site, domain name and that all important 320K quality that existing Shoutcast users can only dream about. And how much is all this (and more)? A highly competitive price of US$25 per month (with a yearly US$30 membership fee). 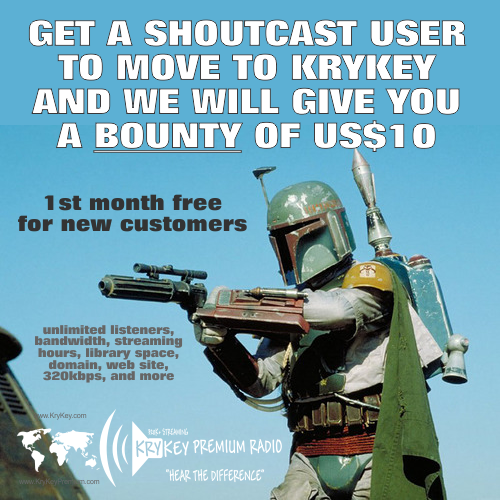 That is a US$75 saving per month by using KryKey instead of Shoutcast. Currently the stream is ‘only’ from a flash based player, but by Jan 2014 the streams will be available on iOS, BB, WP, Android and even feature phones. If you help a Shoutcast user to move to KryKey, then we will pay you a bounty of US$10 - AND - the new KryKey user will get the first month free! (membership required). Go to CLICK HERE and sign up via our online PayPal service. Why Tune Into Your Radio Station? Anybody can stream music from a number of music streaming services like Pandora or Spotify or Rdio or Rhapsody, and on any device at anytime, so why would they "tune" into your radio station? You need to offer what other music streaming services, we call them jukebox services and 'not' radio, don't or can't offer. We have all read lots lately on the increasing importance of "music curation", or what radio pros call "programming", for these music jukeboxes services. Jon Maples, who's VP of product-content at musis service Rhapsody, has shared some of what his company has learned about how music programming impacts customer usage. Beyond solving what Maples calls "the catalog problem" for the user ("What do I listen to? "), good music curation can help maintain an audience by minimizing "churn." So there is one advantage you have immediately, you or your stations hosts are the "music curators". Your listeners can just listen while you select the music. Lots of people have streamed from one of these jukebox services and what they all have in common is the sound quality. Although it sounds good, once you listen to music being streamed by YOUR (KryKey powered) radio station at 320K+, the difference is like AM and FM. This is your next advantage, 320K streaming quality. Human contact is becoming an issue, as more and more people seek this, while the world gets more and more impersonal as it digitizes. Your radio station can offer this with you and or your hosts talking between songs, talking to your listeners using the call DJ button or even via the radio station's chat room. This is another advantage you have over the other music streaming services. Your Radio station can be a community, while the other streamings services cannot. The word "community" is derived from the Old French communité which is derived from the Latin communitas (com, "with/together" + munus, "gift"), a broad term for fellowship or organized society. Communities can be the ones you know of like tutoring, hospitals, sports and your radio station. Your programming should involve as much live shows as possible, someone in the driving seat, spinning the music, talking, interacting with your listeners - your listerns are human and not machines - your radio station has a human driving it, unlike the other streaming services which are driven by machines. Also this is importnat - When your not having live shows, make sure the playlist is short and you change it often - keep it fresh! Do this and when people find your radio station, they will stay and listen and come back for more and recommend you via their social media. As a DJ, I love today’s internet era for music. It is possible to reach a global audience far easier than ever before and the opportunities for DJs are endless. I use a range of platforms to promote my music and I wish today to speak about internet radio and the fabulous opportunities offered by the new KryKey Premium network. I will compare and contrast the service with various competitors and prove to you that KryKey Premium (www.KryKeyPremium.com currently under an upgrade) is the ideal internet radio solution for you. I have been a member of the KryKey network for about four years, since its early days with the Pilot KryKey 1.0. I run several stations there. One is streaming my DJ mixes constantly and links into my main website. Another runs music for my artist management company, an essential tool in showcasing our music. I have another for my local community’s radio station, where we run regular live shows, with audience participation and phoneins. I find the KryKey platform easy to use and the fact it’s a free service is an added bonus. The customer support is second to none and I have been advised on everything needed to my satisfaction, from intricate webpage embedding, to radio programming and uploading music. One of the best aspects I have witnessed about KryKey’s service is the friendly community that has built up around radio station owners. There are several active groups and forums across the social networks, where radio hosts can mingle and get advice, share shows and promote their material. KryKey is a network with over 25000 radio stations across the world now and it is one of the largest web radio hosting sites available on the internet. You must understand that with such a high volume of stations with millions of listeners, it is very difficult to get customer service levels so high for a free service. The bosses at KryKey decided that they wanted to develop a new premium service, where radio station owners will be charged a small fee and get an overall better professional level of service for their radio stations. It was to separate the ‘wheat from the chaff’, to create a streamlined professional service, to the client’s benefit, for the more serious stations out there. 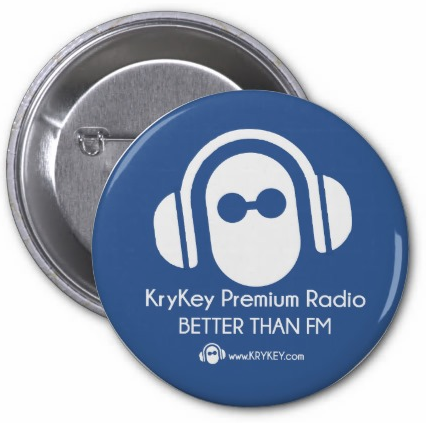 KryKey Premium is an innovative solution and although still in its infancy, if you are serious about web radio, it is an option you should definitely be considering. What services are out there for DJs on the Worldwide Web? I publish a lot of DJ mixes as well as producing my own music. I subscribe to a lot of different services, some of which are free, some charge a membership fee, often a recurring monthly payment. Soundcloud is probably the number one website for musicians in the world. It is easy to use and its membership fees have recently dropped from 59 Euros a month to 9 Euros monthly for their top premium level service. There is a lot of traffic on the site and the public can access your music in a variety of ways, from the web itself, from apps for ipad and PC / Mac and also mobile devices, both android and iphone. Also, it is easy to embed widgets from individual tracks to sets, in your own website, and for other people to do the same. One drawback to soundcloud is that they have recently started suspending a lot of uploaded music for copyright infringement which is a bit of a blow if you are releasing prerecorded DJ mixes. In addition to Soundcloud I also use Mixcloud which is a free service (unless you wish to pay to promote your mixes) – It doesn’t get anywhere near the traffic levels of its big brother, Soundcloud, yet is a convenient and easy to use platform for mixes, podcasts and recorded radio shows. It is growing in popularity and as Soundcloud battle with DJs over copyright on their mixes, I can see Mixcloud becoming ever more popular. One of the drawbacks of Mixcloud is that the quality of their streaming is quite poor at only 192 kbps, and also mixes cannot be downloaded. Podomatic is one of the oldest and more established services for podcasts and prerecorded radio shows and DJ mixes. It generates good global traffic and despite it appearing fairly dated, it offers a good community aspect to its service. Costs are fairly low. I currently pay about $250 a year for my hosting which covers a high bandwidth and a 15GB storage space for my work. An advantage of Podomatic is that any podcasts uploaded can be accessed directly in itunes, which many listeners find convenient and advantageous. Youtube is a free service though it is used more for single tracks and short podcasts. It is a very popular place for music, though I feel that DJs aren't fully supported by its services and prefer to use other options for my work. Other sites I use include Last.fm, Mixriot and Play.fm. Last.fm has made it difficult to now upload larger files and I had to stop uploading DJ sets about 18 months ago. It is a useful tool for listening to music and by paying the small £3 monthly subscription fee you get premium access to all its features. The last.fm player is a great way to hear your favourite songs and also to discover new music. Mixriot is a much smaller network where you can upload mixes and become a premium member for a small one off fee. It has a friendly community and is worth getting your stuff heard there. Play.fm is a free service and although initially very popular, I think its power has waned a little with the rise of Soundcloud and Mixcloud as the listeners’ avenue of choice. Beatport, where I buy most of my music is in the process of setting up a DJ mix uploading service, where i think mixes can be sold so that is an avenue for my work I eagerly anticipate. In addition to the music sites, you have to have a good presence on the standard social media networks and also forums. By running good sites you get to liase directly with your fanbase and promote your material very easily. Although mostly free services, sometimes it pays to invest in marketing your pages on these sites. Facebook, Twitter, Myspace are all critical to a modern day musician and a good presence here will do you lots of favours. It is well worth signing up to specialist forums on sites as you get to meet good people and get good feedback on your work. All of the above solutions are fine and dandy for a DJ’s work, but what about the more traditional approach to promoting material? Radio has been the backbone of a DJ’s life since people first took to the turntables. Listeners enjoy the scope and variety and ease of a continuous broadcast, where they can check out their favourite presenters, listen to their preferred music style and interact directly on air. Web radio takes radio to a new level, with live chatrooms becoming available to listeners and your favourite stations being able to be accessed direct from home or work or mobile device. I am a longstanding advocate of KryKey and when I first discovered their service I realised the potential and how different it was compared with the other sites I frequented. I wasn’t a radio newbie and had experience of working on my university’s radio station and specialist dance music stations, even some web radio stations that had picked up and been promoting my work around the world. KryKey provided me the opportunity to create my own station, run my own material constantly and give my listeners a new way to hear my work in a convenient and fun fashion. An advantage of KryKey is that the studios are easy to use and it is easy to set up and teach DJs how to use the website, to broadcast as guests on your station, all you need is a computer with web connection and if you plan on speaking on your shows, a cheap usb microphone or built in computer mike will suffice. It is easy to upload music and running a live show is very fun and easy to do. All you need to do is promote the times you begin a little, across your social networks, and watch as your audience builds across the globe. I find it addictive looking at listener numbers which are available in the studio and it is also possible to get a free interactive global map showing where in the world your live listeners are coming from. The inbuilt KryKey chatrooms are very popular during live shows and it is great being able to interact directly and in real time with your consumers. People are more inclined to give feedback on your work during a live web radio show than they will while accessing prerecorded material elsewhere. When you haven’t time to run live KryKey shows, it is possible to stream playlists and podcasts, so that there is never dead air on your station. A lot of KryKey station owners have found ways to supplement their income by running adverts on their shows and even though people can be earning good money it is amazing how KryKey has remained a free service for so long. Things on Krykey are quite saturated now and the servers get very busy with listeners and lots of uploaded music. This is where the concept of KryKey Premium was born. It was to offer a better service to the more serious web radio aficionados out there, where your investment would guarantee a highly professional more innovative solution to your radio station needs. Before I discuss the advantages of KryKey’s new premium service I wish to compare the other options available to a potential web radio station owner. By assessing other sites, you will be able to see how KryKey Premium is perfectly adequate for your needs. What is the competition? 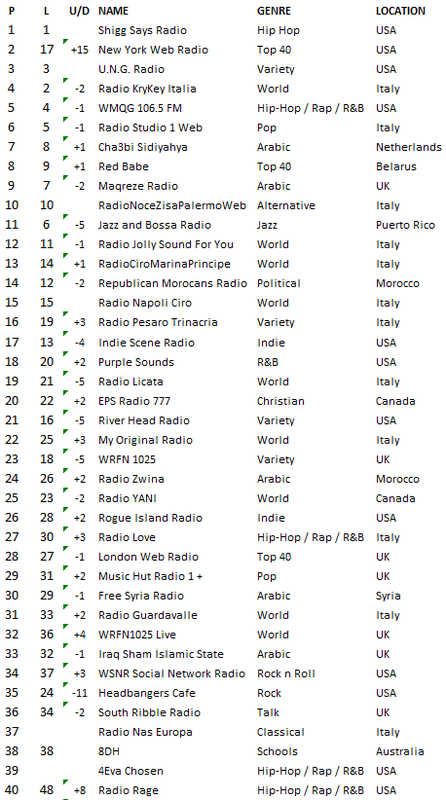 There are many web radio providers. Some charge for their services already, some are free. On the whole most do not offer the qualities of KryKey and the KryKey Premium network. It is possible to broadcast independently. It is not that easy to setup and requires some technical wizardry. Also, one of the disadvantages of independent broadcast is that you cannot easily promote your station via the host’s network so you have to source your listeners independently too, so will therefore maybe struggle for numbers. In addition to this it will usually cost for servers so you are perhaps better off beginning with a specialist provider. KryKey (www.KryKey.com) is free and as already discussed, is a great tool to begin with. The main competitors for KryKey at present are: Radiomomy, Blogtalk, Spreaker and Live365. All are platforms which perhaps ought to be explored by you personally before you make any decisions, but here I wish to discuss some of the advantages and disadvantages of each one. 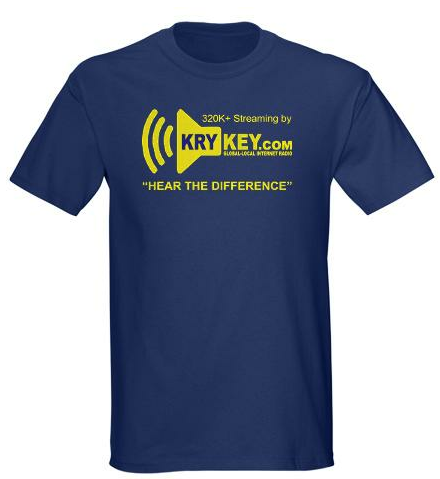 Firstly, it should be noted that all of the above services fail to deliver the high quality audio that both the KryKey and KryKey Premium can offer. When a listener tunes into a web radio station or indeed any web audio / video or website resource, bandwidth is consumed. Many listeners consume lots of bandwidth. The quality of audio offered affects this bandwidth. If a poor quality mp3 is streaming at say 96kbps, it will consume less bandwidth than a 320kbps high quality mp3, therefore you can approximately consume 3.5 times as little bandwidth with poor quality 96kbps music. The problem is that listeners do not enjoy low quality music streaming. I discussed Mixcloud earlier and a disadvantage with it being the fact that music is compressed to 192 kbps for listeners. 320 is the standard audio that I record in and it is easy to hear the bad sound quality when that is compressed to 192. Both KryKey and KryKey premium broadcast at 320kbps, the highest bitrate available and provides the best audio quality for your listeners. With the millions of worldwide listeners tuning into the 25000 stations each month you can only be in awe of the tremendous expense of the servers which broadcast this. All of the competing services mentioned cut costs here and sacrifice audio quality to reduce their outgoings. Radionomy, Blogtalk, Spreaker and Live365 all broadcast at 128 kbps bitrates. This is 2.5 times less quality than the music you hear on KryKey. Tune in and check for yourselves? Is this the standard of quality you wish to demonstrate to your audience? When you buy an MP3 in the stores it is provided to you at 320Kbps. Surely when you listen on the radio, you want to hear the same quality as the music you can buy? What are the storage spaces available for your uploaded music in your station? To run a successful radio station with many different shows, you are going to need a wide selection of music at your fingertips. Ideally, you want to upload as much of your music collection as possible to your archives so that it is available immediately for a versatile selection of tunes. Blogtalk doesn’t store music at all. Spreaker allows you to store 1500hrs of music at a premium cost of $119.95 monthly. Live365 allows you 6GBs worth of music data for $99.95. KryKey’s free network provides 2GB of storage space and the new KryKey premium has an unlimited allowance, incorporated in its total package cost, so you can upload as much material as you desire. Some of the alternative providers cap the number of listeners your station may have, to ease their bandwidth usage. Blogtalk, for example, allows only a maximum of 250 simultaneous listeners to your station. KryKey has no caps on listener numbers and your popularity thus can completely hit the roof... As you get more confident and more established at your station you will be pleasantly surprised at your global reach and popularity. Web radio is indeed perfect for expanding your fanbase. At Blogtalk you are restrained to only broadcasting for a maximum of 3 hours a day. Spreaker allows up to 5 hours for a cost of $49.99 monthly. At KryKey and KryKey Premium you can broadcast 24-7. Even when you aren’t live, you can leave playlists of music streaming. The alternative providers all have a sole studio option. If you wish to have guest DJs, this means you will have to hand over control of your main account and passwords to them so they can use your station. KryKey and KryKey have had the foresight to provide you with two studio solutions, one for station admins / owners and another solely for DJs. (Spreaker does allow for separate DJ logins, though to the same studio). There can be multiple logins for numerous DJs so in effect there are many studios available. If you aim to run a successful station you want to have the support of a multitude of presenters and KryKey has had the foresight to be able to provide you with this. For the ease of listeners accessing your site, it is preferable to have a custom domain you can refer them to. Radionomy provides this solution for a host, but with conditions attached. KryKey will provide you with a domain (.tk for free clients, a .com for Premium clients). Also, KryKey provides a custom built website service for your station so you can perfectly tailor its appearance, according to your needs. Spreaker, Live265 and Blogtalk all don’t provide this service so you are limited to using their own urls. For web search engine ranking you will gain more trade with your own independent url. None of the providers give you your own email address, but one of the advantages with KryKey Premium is that you get an @krykey.com email set up which is forwarded to your primary email at no extra cost. All competitors provide a level of social integration and KryKey’s custom built sites and webpages will build you facebook fanpage like boxes, incorporated in your site design, helping you build your fanbase easily and conveniently. What about chatrooms? The only competitor service to offer a Scrolling Marquee chatroom comparable to that of KryKey’s easy to access one, is Blogtalk. I have already discussed how pleasant and valuable the use of the chatroom is during a live KryKey broadcast. Live 365 requires you to install software to run your radio station but all the others, including KryKey are purely web-based, thus easier to control. Blogtalk offers a priority live technical support. KryKey’s live technical support is by email on the free network and the KryKey Premium services guarantees a second-to-none level of direct customer service, thus ensuring that any problems and queries can be effectively ironed out, in a fast and efficient manner. It is a real selling point of KryKey Premium to be able to access 24-7 total support with queries often being directly addressed by the company CEO and founder himself. The simple volume of numbers of the free network do not allow this to be permissible. KryKey Premium aims to take you on board to a team or perhaps extended family so you can help shape the company into how you want it to be in the future, so support from the top is one way in which this can be realised. Your views are important to the top of the company, something which any users of large websites such as Soundcloud or Youtube (or Facebook or Twitter) may notice is deficient these days. These large megaliths do not take seriously the problems of their customers any more and will ultimately leave them in decline. Support is an essential part of the internet radio hosting experience and KryKey delivers well ahead of its competition in this aspect. As a newcomer to internet radio or radio broadcasting, you probably are a novice when it comes to your skill level. Radionomy requires a high skill level for the use of their services. Blogtalk and Live365 require a medium level of skill or experience, and only Spreaker is on a par with KryKey and KryKey Premium in terms of its ease of use for those with low skill level in their internet radio experience. KryKey Premium has an advantage over rivals in that it offers a private club to its members and users are encouraged to join the social networks and forums where they can share ideas and promote themselves. Customised drops for example are made freely available which can certainly help in programming your shows. KryKey Premium is set up to be different from the free KryKey network, in that it has its own servers which provide a much faster and more reliable delivery of web radio. Broadcast at the highest 320kbps quality, there will not be slips in the stream and technical issues are far less frequent. KryKey is always developing its software. KryKey Premium users are the first to benefit from the beta testing of version 3.0 which offers far more features to the radio stations. For example it will be possible to stream Youtube playlists and urls in your playlists. Spotify will also run with the studio setup. Also Soundcloud is supported and partnerships that are built with other music providers will be available first on the Premium network. KryKey free doesn’t offer mobile support yet KryKey Premium, from its inception introduces mobile device capability so that you can reach your listeners on the move. As mobile devices access the internet more these days than even home computers, this market area is critical to maximise your listener base and with KryKey Premium’s app support for mobile devices your audience will be well satisfied. What about pricing for KryKey Premium? You have heard a lot about KryKey Premium’s services and how it compares with competitors. What should make you choose KryKey ahead of the opposition? Certainly for the level of service provided, KryKey Premium’s price structure is a lot more affordable and gives you value for money. 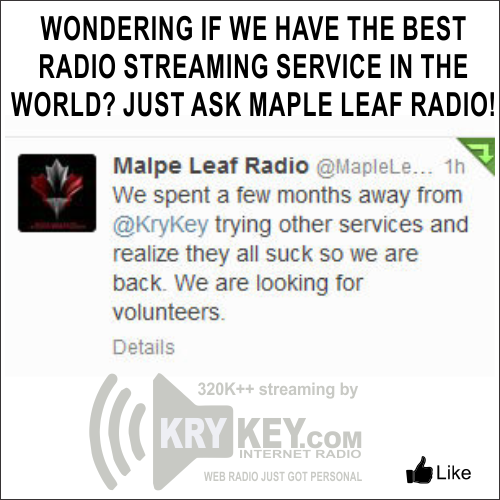 There is a yearly fee for new KryKey Premium radio station owners of $30. This membership fee is used to set up your customised .com urls so your site can be as independent as possible (in addition of course to being hosted on the main network). There is a running monthly subscription cost in addition which is $25. These funds help finance the accelerated servers and go towards future developing the KryKey platform, so you stand to benefit in the long term. When you compare the price structure with other radio providers you can see you are definitely getting value for money. A better overall professional service, at a fraction of the cost. KryKey has been busy, busy, busy over the last few months and our blogging has been pathetic, and most likely will be for a few months on :) but don't despair, you can catch us on Twitter and Facebook to keep up to date on what we are doing. We reached 55,000 radio stations two weeks ago and with now over 27M listeners to them we have had to unfortunately stop any new radio stations for the foreseeable future to make sure existing stations and their listeners get the best quality. We are working on a solution which we think we can implement by August 2013 and allow more new stations to be created. 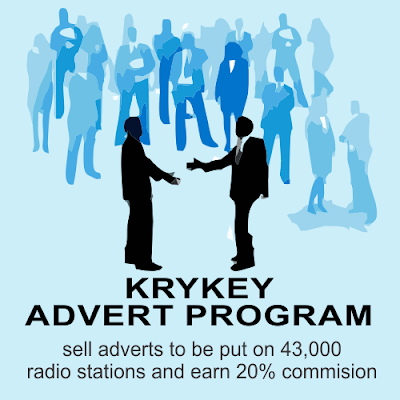 The KryKey Premium Network has a very, very limited and exclusive number of stations that are available. Stations have to 'apply' to join and if selected then there is a US$30 membership fee (yearly) and a US$25 per month station usage fee. Interested? then contact the KPN via premium@KryKey.com. When people leave our service they ask us to remove their radio station and we remove all their details and these stations are available for use. They are listed when you do a search and displayed as "1 - RECLAIMED STATION" - there will be a small fee to claim one of these stations of US$10 - if you would like one of these stations email us and just ask! You have seen the graphic at the top of this post and we have ordered only '100' of these dark blue with yellow graphics t-shirts and they will again be free! All we ask is you send in a photo of yourself in it so we can post on our interesting KryKey T-Shirt Pinterest Board (click here to see it). As usual this USD$20 t-shirt is yours FREE and you will need to pay (via our PayPal account) the postage which is between US$5-US$8 depending on your country. You can now have you station listed in one of these sections on the front page of KryKey.com for a small US$25 a month fee. If you are leaving, please email us your request to remove your details (and station) and the sign-in details. As a precaution to make sure of ownership we ask for the sign-in details with each request. KryKey radio stations can access our forum (click here) and find hundreds of pre-recorded promo-tional clips (jingles / drops) for use on their station and can be uploaded to their 'promo' library. New ones added each month. What's the crucial career strength that employers everywhere are seeking -- even though hardly anyone is talking about it? A great way to find out is by studying this list of fast-growing occupations, as compiled by the U.S. Bureau of Labor Statistics. In our fast-paced digital world, there's lots of hand-wringing about the ways that automation and computer technology are taking away the kinds of jobs that kept our parents and grandparents employed. Walk through a modern factory, and you'll be stunned by how few humans are needed to tend the machines. Similarly, travel agents, video editors and many other white-collar employees have been pushed to the sidelines by the digital revolution's faster and cheaper methods. But there's no substitute for the magic of a face-to-face interaction with someone else who cares. Even the most ingenious machine-based attempts to mimic human conversation (hello, Siri) can't match the emotional richness of a real conversation with a real person. Visit a health club, and you'll see the best personal trainers don't just march their clients through a preset run of exercises. They chat about the stresses and rewards of getting back in shape. They tease, they flatter -- maybe they even flirt a little. They connect with their clients in a way that builds people's motivation. Before long, clients keep coming back to the gym because they want to spend time with a friend, and to do something extra to win his or her respect. It's the same story in health care or education. Technology can monitor an adult's glucose levels or a young child's counting skills quite precisely. Data by itself, though, is just a tool. The real magic happens when a borderline diabetic or a shy preschooler develops enough faith and trust in another person to embark on a new path. What the BLS data tells us is that even in a rapidly automating world, we can't automate empathy. AND it is the same with internet radio! Sure people can subscribe to music streaming services like Pandora and Spotify, but what people really like more is an interaction with a human, yes a DJ (host) on a radio. People WILL tune in more if you have shows where people in the Studio talk, interact via the Call DJ button, in the stations chat-room, but most importantly they want to hear a voice, and that person talking about the music they are playing, what they think, how it makes them feel, taking requests, just having that human connection makes all the difference. A big thanks to George Anders, who is a contributing Writer at Forbes magazine for some of this post.